Although they may be adorable and small, newborn babies come with a lot of “stuff.” Among the little clothes, diapers, and furniture, there is a lot to think about when decorating, arranging, and organizing a nursery. Naturally, you want to make sure the nursery looks just as cute as your baby. Here are a few tips for a functional, well-organized, and beautiful nursery. Many soon-to-be moms and dads have the walls painted and pick out bedding and mobiles and perfect outfits before they even think about buying and arranging the furniture. Cribs, changing tables, dressers, and gliders take up a lot of space. You want them to look great but it is even more important to place them in practical spots in the room. To help create flow in the room, functionality should be considered a top priority in a nursery. The function of the room depends on the activity. In this case, think about sleeping, feeding, playing, changing diapers and clothes and so on. Ask yourself what you will be doing the most often. If you lack space, consider placing furniture not only against the walls, but in the corners as well. 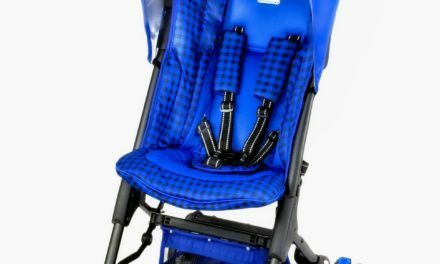 Optimal spacing and safety are important considerations when locating key pieces of furniture for a comfortable and convenient nursery. One of the focal pieces (and most used pieces) of furniture is the crib. After rocking or feeding the baby, the transition to the crib should be as smooth as possible. Keep a small nightstand or side table near the rocker and place a dim lamp on it. This item can be ideal for bedtime books and empty bottles after feedings. A small drawer in the nightstand can hold easy-to-reach cold tablets or burp cloths when needed. You also want to keep the crib away from the door so that when you peek in to check on the baby, you don’t wake him or her. Lastly, the crib should be located away from a drafty window and away from curtains and draperies where the baby can easily reach, to avoid choking or other hazards. The glider can be placed near the window so mom can look out while feeding. Another key piece of furniture is the changing table. When changing the baby, diapers, wipes, and a fresh clean outfit should be easily accessible without having to walk away and leave the baby. The changing table should be close to the dresser so you can easily and quickly grab an outfit. Keep the diaper pail and hamper near the changing table as well. This way you can discard the diaper and dirty clothes without leaving the baby’s side. There never seems to be enough storage for all the baby’s necessities, and traditional closets with just a standard bar to hang clothes are often not cut out for efficient use. Get creative by placing a small shelf inside a closet if you lack a closet system. Place a tension rod in the middle of a bookshelf and remove lower shelves for hanging clothes. Lack closet drawers? You can use baskets or crates for accessories, extra diapers, or books and toys. You can also use a shoe organizer on the back of a closet door for hats and accessories. Chances are that you have purchased clothing that the baby doesn’t quite fit into yet. Organize these clothes by month with clothing dividers. Do you still need more storage? Cubed shelving with bins is a great solution. A large cubed shelving unit creates extra storage and shelving, while a small unit provides a table top for baby’s things. Bins can hold everything from extra diapers to toys and keep them out of sight. They are also transitional and versatile for when the baby becomes a toddler. Bins can be removed and cubes can be used as shelves for books, piggy banks, and decorative items. Now that the furniture is placed properly, it’s time to decorate. Framing favorite nursery books or pages with illustrations makes simple DIY artwork. Of course, baby’s name or monogram is a must and adds a personal touch as well. You can also add your own style with a rug and wall decals. But decorating with double duty in mind is a great way to combine fashion and function. Use picture ledges on a wall to hold and display books. A row of fabric-lined wicker or wire baskets can be hung on a wall vertically or horizontally for attractive toy storage. 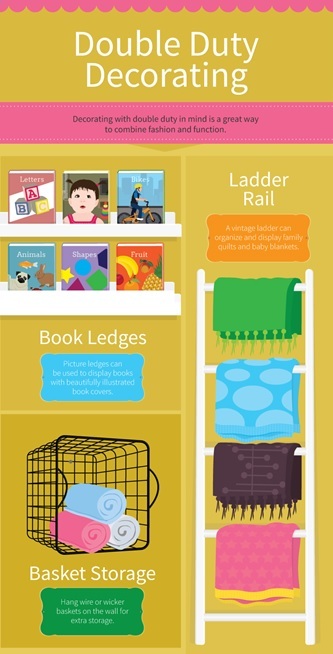 A vintage ladder against a wall can display baby blankets and quilts. Don’t forget about shades and curtains. Not only should they reflect your style and color scheme, they should also be easy to draw for naptime and bedtime. Black- out shades, liners, or roman shades work well in a nursery. You can anchor them with decorative curtains, satisfying both beauty and function. 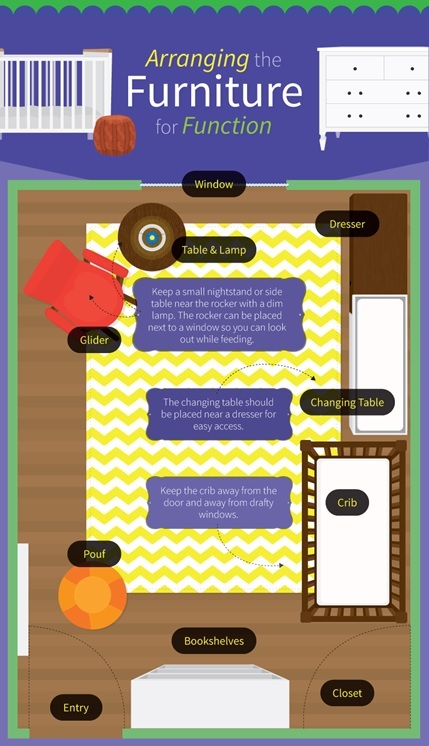 As you can see, there is a lot to think about when preparing a nursery for your little one. From proper furniture placement and drawer organization, closet set-up to double-duty decorating, the best thing to keep in mind is that if it doesn’t work, change it. After about a dozen diaper changes or so, you will be able to make slight changes to best fit the needs of both you and your baby. 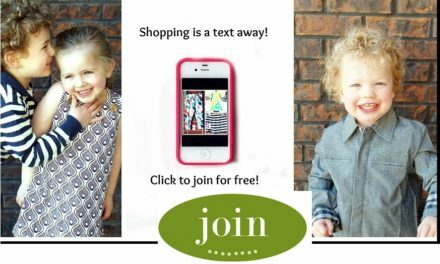 Shop For Kids Clothes The Lazy Way! 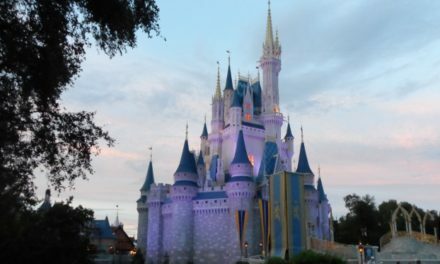 Why Your Stroller Should Be Royal!